ADOPT ONE CAT AND YOU CAN TAKE HOME A PAL FOR NO ADDITIONAL ADOPTION FEE. To celebrate this wonderful month we will be having an adoption special. If you adopt one cat you can adopt a second cat for no donation fee. We love our cats at Francisvale and we are hoping this month to hit a record high with cat adoptions. We have already adopted two in the first week. Let’s keep it going and get some more cats their forever homes. 1. If you are thinking about adopting a cat, consider taking home two. Cats do well when they have a buddy. 2. Find a cat whose personality compliments yours. 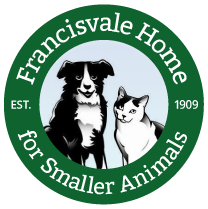 Francisvale has many cats with different personalities. 3. Pick out a veterinarian ahead of time if you don’t already have one, and schedule a visit within the first few days following the adoption. 4. Make sure everyone in the house is prepared to have a cat before it comes home. 7. Cat proof your home. 8. Go slowly when introducing your cat to new people and other pets. 9. Be sure to include your new pet in your family’s emergency plan. 10. Enjoy being a new pet parent! This entry was posted on Tuesday, June 5th, 2012 at 11:28 am	and is filed under News.